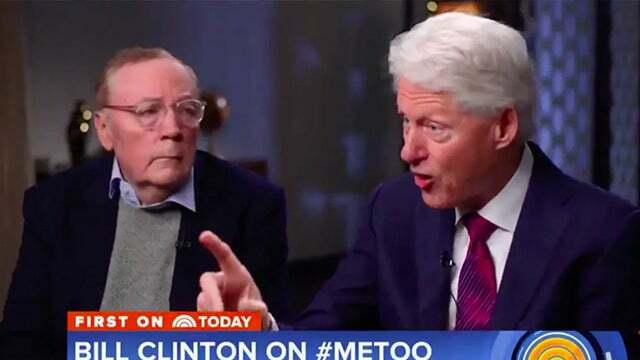 RUSH: Bill Clinton. He was on NBC. Been a lot of places. Got a new book out with James Patterson, The President is Missing. He and Patterson are doing interviews. Patterson isn’t speaking. It’s all Clinton. It’s not going over well. Mika Brzezinski, who’s part of the Morning Joe team, is in shock. After watching Clinton today, she said (imitating Mika), “My God, my God, it sounds just like Trump! He didn’t do anything. It’s everybody else’s fault.” She is terribly let down and disappointed. CLINTON: Well, I don’t think it would be an issue because people would be using the facts instead of the imagined facts. If the facts were the same today, I wouldn’t. Don’t we have a right to change the rules? Yes, but you don’t have a right to change the facts. A lot of the facts have been conveniently omitted to make the story work. I think partly ‘cause they’re frustrated that they got all these serious allegations against the current occupant of the Oval Office and his voters don’t seem to care. I think I did the right thing. I defended the Constitution. CLINTON: Yes. And nobody believes that I got out of that for free. I left the White House $16 million in debt. But you typically have ignored gaping facts in discovering this, and I bet you don’t even know them. This was litigated 20 years ago, two-thirds of the American people sided with me. They were not insensitive to that. I had a sexual harassment policy when I was governor in the ’80s. I had two women chief of staff when I was governor. Women were overrepresented in the Attorney General’s office in the ’70s. I have had nothing but women leaders in my office since I left. You are giving one side and omitting facts. RUSH: What is this? He playing the “I was poor” card again? “I left the White House $16 million in debt”? They did steal the silver leaving there. Do you remember that? They did, folks, for you young-uns out there that don’t know, the Clintons stole silverware out of the White House when they packed up and moved out. What is this? “You typically have ignored gaping facts in describing.” And he goes on to talk about all the women he hired. Well, we know that and half of them were on his couch half the time. MELVIN: You’ve apologized to her? MELVIN: But you didn’t apologize to her? CLINTON: I have not talked to her. I have never talked to her. But I did say publicly on more than one occasion that I was sorry. That’s very different. The apology was public. Do you think President Kennedy should have resigned? Do you believe President Johnson should have resigned? Someone should ask you these questions because of the way you formulate the questions. I dealt with it 20 years ago plus, and the American people, two-thirds of them, stayed with me, and I tried to do a good job since then with my life and with my work. That’s all I have to say to you. RUSH: (Clinton impression) “You’re forgetting all the good stuff I’ve done in Haiti. Yeah, I went down there and we got all of kinds of money given to people in Haiti. I got my cut. I got out of there with Hillary, got our share, but they wouldn’t have had anything if it weren’t for us. I apologized to everybody. I didn’t talk to Monica. Well, she was listening when I apologized everybody. She knows. She knows. She was one of the luckiest women in the — any other 19-year-old would have been happy and would have written about it as the greatest thing that ever happened.